I’m supervising one of my 16-year old grandsons this weekend (I have two, almost three, that age right now), watching him with his friends going out in their cars. Supervising means watching with the eye of someone who remembers being 16, remembers the exhilaration of being out of the house in a car without your parents. I remember all the silliness, the stupidity, the fun of being 16. In Tulsa, Oklahoma, in the early ’60s when I was a teen, we cruised. Most of us didn’t have our own, so we borrowed our parents’ cars. I remember wishing they didn’t have such nice cars so it would look like they were actually mine. I don’t think I ever ran an errand for my mother without stopping to pick up a friend and racing to the drive-in. I bet a 15-minute run to the grocery store took me over an hour…I appreciate my mother’s patience and understanding now. My life was the Tulsa version of “American Graffiti.” That movie truly was our story, our music, our lives. We were college bound, smart, good kids, doing teenage things. If you lived in our part of town, you cruised Peoria, Brookside. Other parts of town had their own strip. Peoria was so popular it got the nickname the “Restless Ribbon” for all the teens cruising up and down. We drove down the street over and over from 31st to 51st, watching for friends, cute guys. When you saw someone you knew, you honked your school or club honk. Our radios were blaring with rock ‘n roll from KAKC. We were noisy in those days before someone decided it was noise pollution. Probably someone who forgot what it was to be young. When we stopped at an intersection, you sometimes revved your engine. You flirted with whoever was in the next car. You raced up and down the street. You sometimes jumped at the light, racing a short distance. A game was to see if you could jump out of the car, run around it and get back in before the light changed. I didn’t say we were street smart, just school smart. We didn’t have seat belts and piled as many kids in a car as we could. I once piled in a car with about 10 guys to go to a football game. They teased me and I loved it. 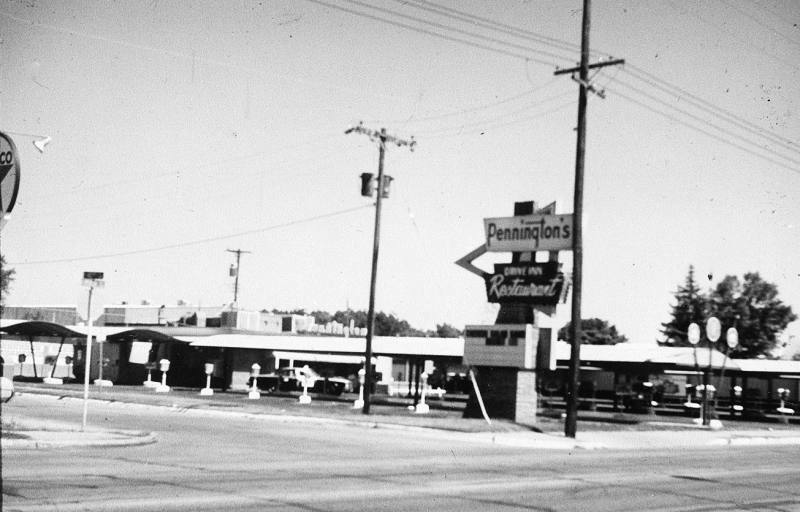 The hub of our world was Pennington’s Drive-In. We cruised through the rows, looking for a prime place to stop on “Soc (pronounced Sosh) Row,” the middle row. Pole Position was right at the front where you saw everyone and everyone saw you. Sherry was the cute carhop and Jake was the security cop. Arch and Lola Pennington were inside, taking orders, making the onion rings, dinner rolls, hamburgers, chicken and shrimp baskets and black bottom pie I long for right now. You pulled in and ordered your vanilla or cherry or cherry vanilla Dr. Pepper and waited for the car hop to attach the tray to your window while you watched to see who else was there and then either greeted them or pretended you didn’t know that carload of guys was watching your carload of girls. We went to Pennington’s for lunch, a quick 30 minute race between the school and the drive-in that seems impossible with today’s traffic. We did it, though, sliding into our desks just as the bell rang. We went after school, after club meetings, after football games, after movies, on dates before you “parked.” I won’t elaborate…you know what I mean. There was nothing like being with someone you liked, knowing everyone saw you together. When you went home and called your friends on the actual phone with a cord, you talked about who you saw cruising, who was at Pennington’s. There were other places on the Restless Ribbon. Mr. T’s was at 36th & Peoria, although that was more of a hangout for the guys. When I was a senior, someone opened a private club for teens, the Ship’s Wheel, at 41st & Peoria. My boyfriend joined and we went there to sit and talk and to dance to live bands. I don’t think it lasted long…I only remember it my senior year. Mostly, we just cruised. It was what we did, cruised and talked and laughed and listened to music and looked for our friends and suffered awkward silences with new dates and sweet moments with special ones. Last Friday night, I cruised Peoria again, as I have done for most of my life. This particular time I was with my 4-year old granddaughter and we headed to the drive-in, the drive-in pharmacy this time, and then down the street to the frozen yogurt shop. I passed the place where Pennington’s was, a Kentucky Fried Chicken now, and had a memory of what once was. Usually I go by without a thought, but that night it all flooded back. I was on the same street I’d cruised so many times. It was crowded and busy with shops and restaurants, still a hub of town, of the neighborhood. It was only 7:30, the Restless Ribbon was getting busier with nightfall, just as it always has. I don’t know where my grandsons and their friends go because I know that they aren’t allowed to cruise like we did or stop and congregate without suspicious neighbors and the police watching and gas is more expensive and their parents (or grandparents) are checking on them with GPS and cell phones. Too bad. I have a ribbon that runs through my mind of sweet memories…cruising with my friends. Fantastic! Loved your post – would you mind sharing it over at RestlessRibbon.com? Please? Also any other Peoria/cruising/60’s memories or photos you might care to? Thank you! Love your website & will share the article when I have time to see how to do that. Thanks for putting a link to my blog,too. I manage the private Facebook page for Edison ’63 class & will share the link with them. Great! Thank you in advance for sharing – always on the lookout for stories, memories and photos from ‘bitd’. You can simply cut & paste your post into an email or whatever. Your call. Appreciate the help too ; valued contributor ‘DrillerAA’ is an Edison 65 grad!